Bowfishing is the process of hunting fish in fresh water with the aid of specially designed archery equipment such as the crossbow or c﻿﻿ompound ﻿﻿bows. Bowfishing is a fast growing sport which has attracted males and females in equal measure. The methodology entails shooting the fish by the use of these specialized bows and then retrieving them from the waters. A strong and heavy arrow is used to shoot the fish whereas a special line mounted on a reel is used to retrieve the fish. The reel is mounted on the bow. The arrows designed for bow hunting are barbed and specially feature a heavier design so that they can easily force their way down the waters without changing direction. In other words, you need strong arrows in order to resist impact force without twisting or breaking. Bow fishing is normally done both at night as well as during the day with the hunter choosing to either stand on a boat or at the shore. Night hunting is quite romantic with nature and is a sure way of multiplying the thrill and joy not forgetting the fact that it’s more productive. Shooting at least six inches below your target compensates for refraction. There are numerous freshwater species that an angler will have the option of angling. These include the common carp, the grass carp, the alligator gar, tilapia, the catfish, bowfin, the bighead carp and the catfish among others. For saltwater angling, your options include the barracuda the redfish, the flounder, the rays and the redfish sharks among others. Bowfishing is similar but not the same as spear fishing. The hunting employs the use of pointed weapons in the place of baits and hooks. Whereas the model as well as the build of choice will totally always depends on you, as per your own comforts and body type, there are some accessories that must just be considered. A recurve bow is one such type. This features a long curved apparatus that has been constructed to aid spontaneous shooting. With a weight of about 50 pounds, the unit is easy to use. 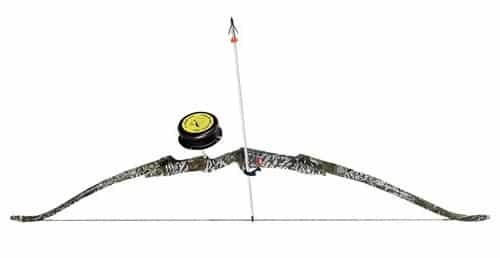 As you buy this bow type, make sure that the type you go for has a ﻿﻿stabilizer hole. Due to its relatively friendly price, it is a great choice for beginners. This is a shorter accessory as compared to the recurve. The accessory features a “left off” or no “let off”. When these bows have the let off, it implies that they are characterized with the slowest possible shooting speeds. On the other hand, the ones having no let off have higher speeds which are still slightly lower than the speeds provided by the recurve bows. Though these compound bow types are energy efficient, they aren’t the best bets for newbie. It is a great choice for the advanced hunters who are seeking for humidity resistance, top-notch velocity together with temperature resistance. As mentioned earlier, the arrows used in bow fishing have greater heft and strength when compared with the standard typical archery arrows. This makes them able to penetrate through the denseness of water, hitting the target with precision. These arrows feature heavier weight fiberglass or solid aluminum construction. It can also feature pure carbon fiber or a fiberglass reinforced with carbon. In other words, the fishing arrows are normally not designed for speed but for force. The feathers and fletching that are characterized with the typical arrows are absent in fish hunting arrows. Whereas these fletching are great in boosting the velocity and power of the typical bows, the same feature reduces power and velocity in water hence must be avoided. When doing selection, ensure that you consider reducing the risks of injury by going for a safety slide which perfectly fits on the arrows. The line mounted on the reel is normally made of Dacron, Spectra or nylon and have a weight rating that ranges between 80 pound to 400 pound tests. 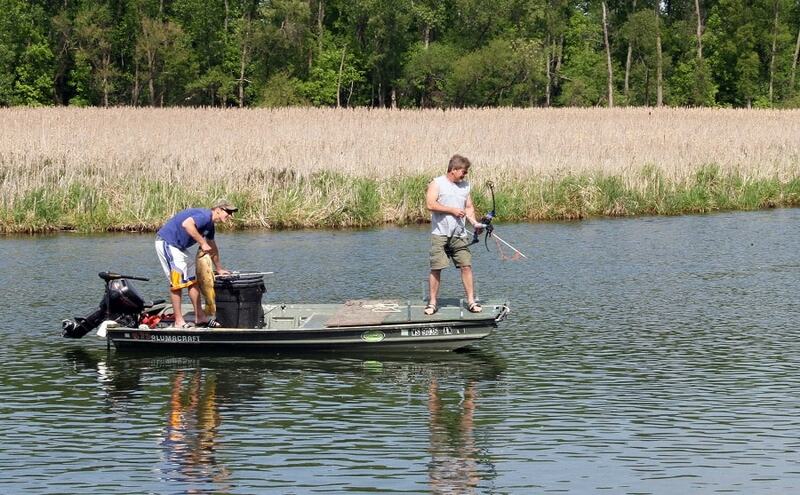 When hunting the alligators, lines weighing 600 pound test can be employed. These lines come in different colors with lime green, orange and white being the typical colors. In bowfishing, you have the options of choosing between the hand wrap, spin cast or retriever reels. The simplest is the hand-wrap type that comprises of a circular spool where the line will manually be wrapped during retrieval. For the retriever reel, a bottle holds the line in place. The perfect choice for advanced bow fishers would be the spin cast reel, thanks to its high speed and precision. It is important to know that the wrong selection of a reel type can greatly hurt the angler. It is thus recommended that an angler goes for the automatically releasing reels that keep off tangles. The snap back types have the capability of greatly hurting you. ​The AMS retriever is a specialized type that ensures smooth shooting that is free of tangles. A good rest comes handy in enabling you hold your arrow (s) in place. The roller rest is an easy to use option, which comes with a fair price tag. On the other hand, the Whisker Biscuits should be considered if accuracy of shooting at peculiar angles is desired. The polarized sunglasses can offer an added advantage when it comes to easy target sighting even when the sunlight rays are glaringly bright. There is also the option of using rubber hip waders to keep you dry as you fish in shallow waters or at the shores. A flat bottomed boat having rails and a quiet motor. This is a takedown recurve bow that has been constructed with bowfishing in mind. It is a bow that is pretty easy to assemble and to use. It is a great option for bow fish hunters, especially the beginners due to its power and accuracy. Its only drawback is the absence of the stringer and the fact that it comes in right hand options only. The bow is a perfect design with a perfect draw weight for accuracy and power. This is a perfect choice for hunters in any terrain and species, ranging from the big commons of the North all the way to the swamp dwelling gator Gar. Featuring composite limbs in conjunction with the high grade aluminum risers, the product overcomes the weather abuse characterized with other bowfishing bows. Not suitable for children as its design only factors the adult in. This package packs all that an angler needs to get out into the waters. With durability, great performance and one of the best ergonomics, it is not an overstatement to say that this is one of the best bowfishing bows in the market. The accessory has been designed and constructed to meet the demands and needs of only the serious bow fishermen. With a special 35.25 inch axle length design, the bow offers comfort for shooting throughout the day or night without experiencing a finger pinch. And with a mere weight of 3.2 pounds, it is one of the lightest and best bowfishing bows ever. Together with all the features that the best bowfishing bow can offer a hunter, the extremely lightweight feature of this accessory is what makes it a dream to be held for extended hours without tiring. The RH Advanced is yet another perfect bowfishing accessory. The tool is made with durable fiberglass limbs and an aluminum handle and comes with#310 AMS Retrieve, which is regarded as among the finest and best reels in bowfishing. The 25 yards of tough 130# test line is part of the reason for such popularity. Accompanying the bow are two PIRANHA arrows having safety slide attachments. This ensures that you don’t run short of arrows when the hunting heats up. And for safety, rubber no-glove finger protection has been installed to protect the hunter’s fingers in the wet fishing environment. Two sure shot PIRANHA arrows that feature AMS safety slide attachments together with penetrator fish points. Features a #310 AMS Retriever: one of the best in the market. Easy arrow removal when the fishing heats up. This is truly one of the best bowfishing bows for anglers who have the desire of gaining powerful performance at a limited budget. Its relatively low cost but without a compromised budget is what makes it a favorite among anglers. Its name describes it all. It is a bow that has an open sight that in return increases the chances of fish nabbing. The Parker STINGRAY OPEN SIGHT is one of the finest or rather best bowfishing bows with regards to performance and efficiency. With an accompanying braided Dacron line, an AMS retriever reel together with a bowfishing arrow having a Muzzy Gator Getter point, you have the best build up combination in a single accessory. Bowfishing has been used for centuries as a method of food gathering. The fact that this form of hunting has now developed into a recreational fishing technique only drives the fascination notch of this activity higher. Becoming increasingly popular within the fishermen as well as hunters, this form of recreational activity is here to stay. The five best bowfishing bow options above, ranging from the highest in quality to the most cost efficient, offer an exceptional base for the experienced and beginner bow fishers to end up with successful fishing expeditions. All you need is to practice so as to garner enough experience and with a combination with the best bowfishing bow procured; you can get out and have fun as you bring food back to the house.